This outing was the “last of the season Polar Bear Full Moon Madness Outings.” Ed Breneiser, WA3WSJ, and I had talked about going up to Mt. Everett for a “true winter camping experience.” But Mt. Everett is about 2-1/2 hours north of me, and about 4-1/2 hours for Ed. Consequently, we postponed that trip in favor of a hike to Round Head just north of Bethel on Rte 501, about a 2 hr trip for me and 1 hr for Ed. Round Head, a promontory in the Blue Mountains, is about a 400’ elevation gain from the road to a vista point overlooking the Schulkill River valley. The AT traverses the area and heads NE along the Blue Mountain ridge. One of the strong points of this area, besides the views, is the camp has a rock fire pit which makes overnight camping very enjoyable because you can have a fire. It was a hot March Saturday for this time of the year. Daytime temps were in the low 70’s which was almost uncomfortable. We congregated at Cabela’s for breakfast at 9am. Ron, WB3AAL; Ed, K3YTR; Ed, WA3WSJ; John, NU3E, and myself all ate heartily then spent an hour shopping. Ed, John, and I then headed for Round Head about 20 minutes west of Hamburg and Cabela’s. The other guys went to a drive-to location on the AT to participate in the Polar Bear event. We got our hiking gear together as we were “cautioned” by John that he “hadn’t been hiking in 20 years and brought along his old HW-8 and an 7 amp-hr gel-cell battery and an assortment of ni-cads. Ed and I were thinking “heavy!” but when he took his 30 yr-old external-frame backpack, it didn’t look THAT heavy and I said so. John immediately replied “that this was only half.” Hmmm, both Ed and I thought. As John pulled out his 16” by 30” sleeping bag I was getting concerned. Then the 12x12x16 Tupperware container containing all the radios, batteries, and other stuff added to our mild alarm. Hmmm, we wondered, how heavy was this gonna be? John “roped” everything onto the frame backpack. I test lifted the final pack….wow, it was HEAVY!! Ed asked me “how heavy was it?” I replied, “Well, let’s put it this way, there’s a lot of opportunity for improvement! !” John's backpack was definitely QRO! As you can imagine, this started off our weekend with a great deal of levity!! We were going to have some fun. We hiked onto the access trail and started up the mountainside. About a ½-mile in we got to the infamous “500 stairs” dedicated to an early 1920’s hiking group in central Pa. The “stairs” were really famous AT rocks generally arranged in a stair-step fashion to go up a ½-mile rock scramble to the top of Round Head. It was fun but challenging, especially for John with his later-weighed 50 pound QRO pack. Dinner (a can of beef stew heated in the fire) went quick and we all had a lot of fun talking and giving John, NU3E, a hard time about being “a rookie” with all of his 20-30 yr old camping gear. We quickly retired to our tents and some QRP activity. Light rain was forecast after midnight so we were all prepared for some rain. It was a brief shower that momentarily woke me at some indeterminate dark hour but I quickly went back to sleep. I awoke at my customary time of around 5:30 or so. I changed my dipole over to 40m (which was a pain because of all the tree limbs, etc….gotta be a better way) and crawled back into the tent and worked a bunch of Elecraft QSOp stations and a number of non-contest QSO’s with folks mostly in the south. I then got up and started a fire in our pit, gathered some more wood, and chiding our “rookie” for not keeping a “firewatch” all night and letting the fire go out. Then it started to rain again. This time it was not a shower but a heavy rain. We all persevered in our tents but wondered if/when it was going to stop. Finally after about an hour we decided to pack up and leave anyway….it didn’t look like we would get a respite from the rain. I was in my rain gear and comfortable as was Ed. The “rookie” however was not really prepared for the rain. 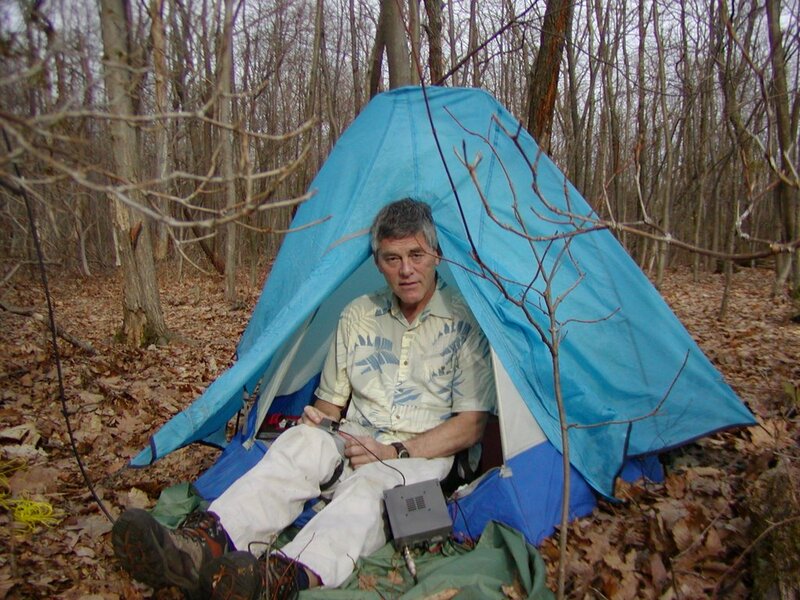 An occasional "drip bucket of water” would come out of his tent….John had several leaks but got his gear together and we all started down the mountain, now more cautious because of the rain-slicked rocks. As Mr. Murphy would expect, it stopped raining. Ed got some good videos of the overall weekend which I’m sure will appear in the upcoming “Polar Bears Gone Wild” DVD!! We got back to the vehicles, loaded up our stuff and then drove up to Dunkin Donuts for some late breakfast and coffee and to start talking about our April “full moon” outing into the Delaware Water Gap, to a site that I had day-hiked into last fall. We reiterated an earlier discussion that “these events are all about the stories”, had a laugh about our numerous fun moments then head back to our familiar home haunts with thoughts about what will our next trip bring…..??? ?